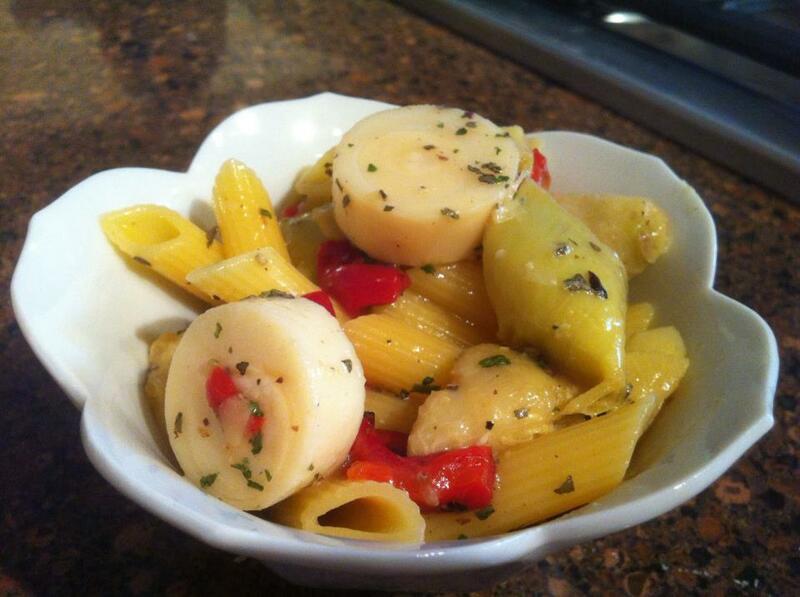 Hearts of Palm Sunday Pasta Salad, also featuring artichoke hearts and roasted bell pepper. 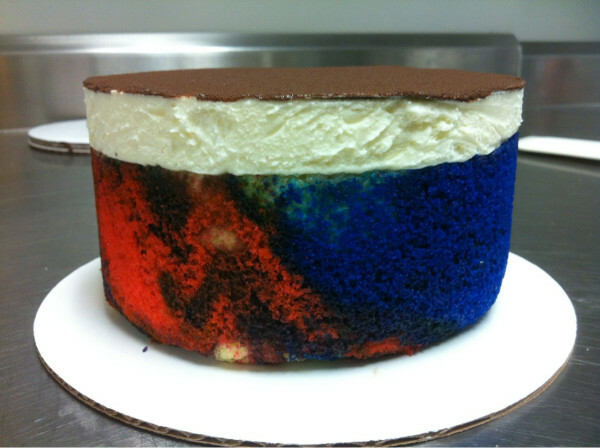 First a side note: Sorry to spam y’all with two Food Blogger Bake Sale posts in a row, especially email subscribers. I had tried to make that second one a private one for media use, and I couldn’t make it work that way. Anywho, share it with your favorite media/internal comm person! My personal Facebook friends got a chuckle (or eye roll) at this photo I posted on Facebook earlier this week, Hearts of Palm Sunday Pasta Salad. I just love pasta salad, and I thought I’d be clever and add hearts of palm for Palm Sunday. Problem is, I’m the only one in the house who will eat those, or the artichoke hearts that were also included. I’m enjoying it for lunch all week. While this dish was a little silly, it’s a spin on my family-friendlier pasta salad that I make pretty often. These days I have to use gluten-free pasta, and the only one for the job is Le Veneziane penne. (You can order it from Amazon, not me, at the link.) It’s made of corn, as are many gluten-free pastas. But the difference is an emulsifier made of flax seeds, which adds stability and texture that most GF pasta lacks. Besides, it’s made in Italy, where there is a surprisingly high incidence of celiac disease. You think they’re gonna mess around with crappy pasta, gluten free or otherwise? I think not. Anyway, here’s the basic recipe. It can be used with or without gluten-free pasta or hearts of palm. 😉 It could be a nice, light addition to your Easter table this Sunday! Cook the pasta in plenty of salted water until al dente. Drain in a colander and rinse well with cool water to stop the cooking process, but do not completely chill the pasta. Gently fold all ingredients except the salt and pepper together. The warm pasta will absorb some of the dressing. If you’re not serving it immediately, put it in the fridge for a little while. (It’s fine to serve warm, too.) When you’re ready to eat, test and re-season with salt and pepper to taste. 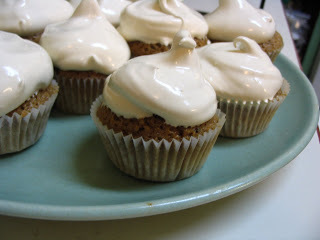 Image from Gluten-Free Doctor of her gluten-free, casein-free spice cake cupcakes. My parents let me embrace the sugary awesomeness of Halloween early on. For several years in a row, I was either a witch or Wonder Woman. (Lynda Carter was totally the bomb, by the way.) I mapped out the neighborhood into short bursts for trick-or-treating, hauling my bag or pillowcase until it just couldn’t hold any more. I made sure to hit the houses known for the really good stuff — one house had folks who worked for Hershey. Go home, dump out my sugary treasures, start again. I remember sitting on the living room floor, my haul unpacked before me, and just eating. And eating. And eating. I’m shocked my parents allowed this, but I’m not saying I’m sorry. These days, traditional trick-or-treating has given way to organization-based functions: church festivals, shopping center events and the like. The one thing that has remained the same, however, is the preschool classroom party. Elementary schools have pretty much outlawed the sugary cupcake-fests in the name of healthy eating, but preschool (or, in our case, Mother’s Day Out) classes still go all out. Thing is, lots of kids also now have allergies or sensitivities to things like gluten and milk or casein. There are a couple in my son’s class who can’t have either, and I cut down his intake on gluten, as well. So, if I’m asked to bring something to the class party, I’ll probably make this cupcake recipe from Gluten-Free Doctor, complete with a seven-minute icing that’s totally dairy free. No compromises, no special cupcakes for the ones with allergies, no problem! I started the evening with the idea that, due to not feeling 100 percent, I was going to start a juice and brown rice fast tonight. No big meal here, no sirree. The husband came home and suggested making something with the two tremendously, obscenely huge zucchini squash a work friend had sent home with him a few days ago. They still sat, looming, largely, on the kitchen counter. “Just slice them, and I’ll grill them,” he said. Oh, my love, it’s never that simple for a fancy pants foodie. I sliced one into rounds. Seriously, y’all, the slices were 5 or 6 inches across. They were a bit scary. 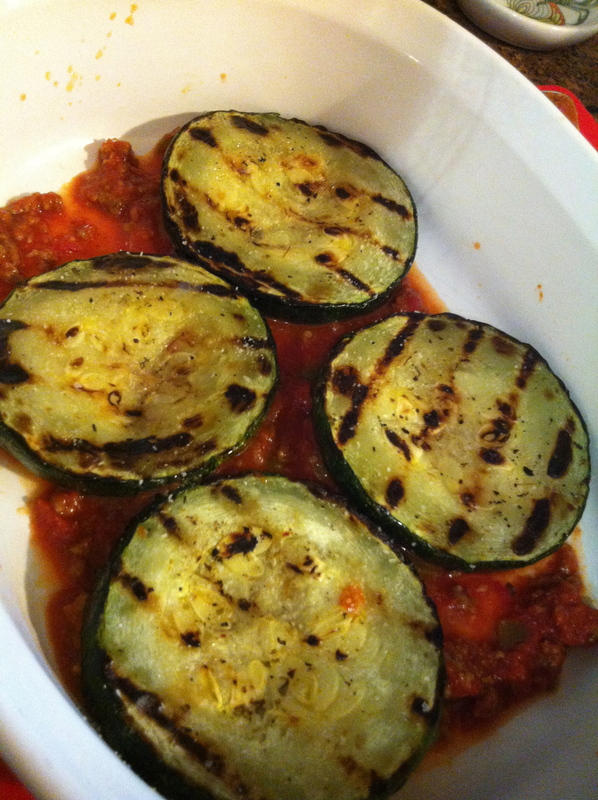 And they were starting to remind me of… eggplant. 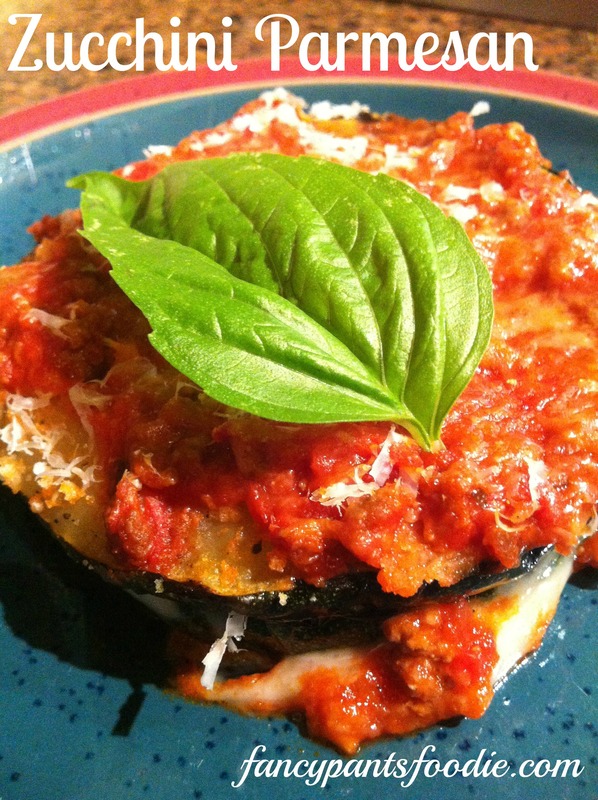 What do you make with eggplant? 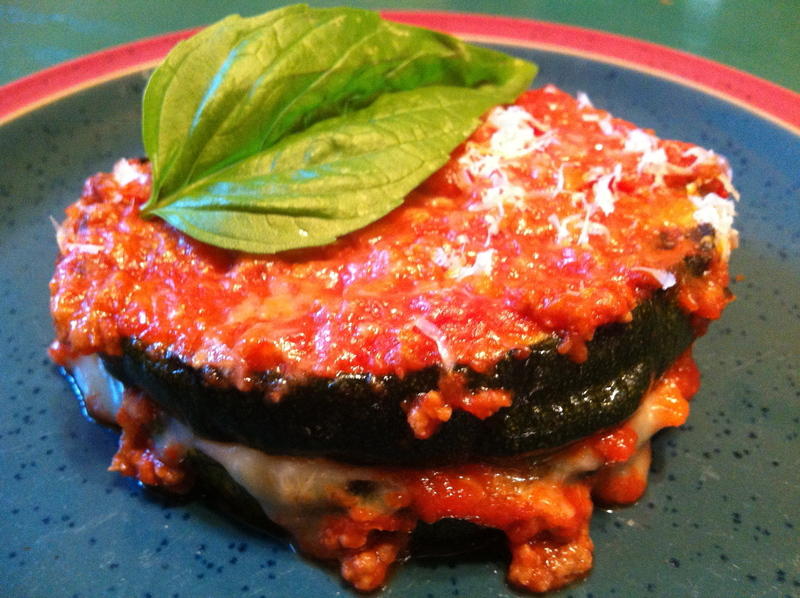 Eggplant Parmesan. Except we don’t really care for eggplant in our house. Even better. I had to quickly vow to myself that I was NOT going to the store. This had to be one of those “use what’s in the house” kind of things. So here’s what I did. I tossed the slices in some olive oil, then sprinkled them with my currently-favorite seasoning mix of Italian herbs and red pepper flakes. 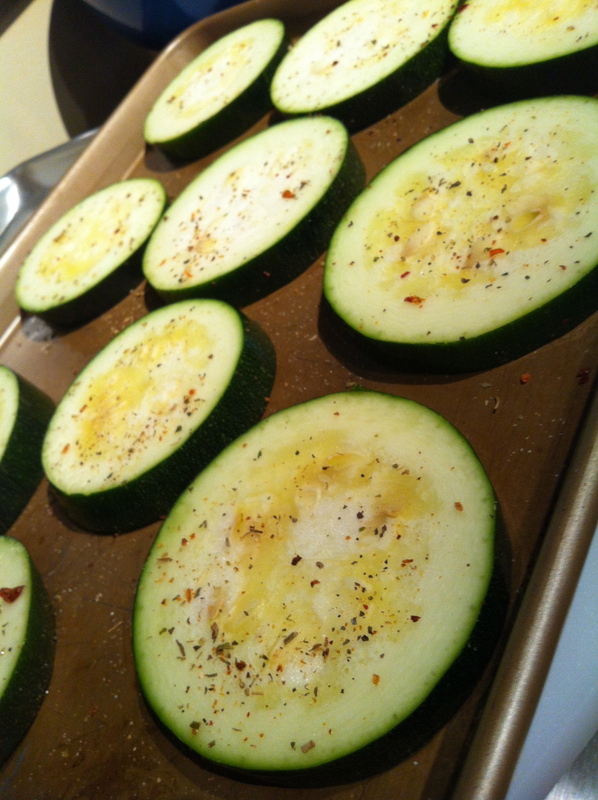 (Don’t add salt yet, or you’ll get smooshy zucchini.) I also did a light dusting of garlic and onion powders. If I were in less of a hurry, I would have minced the real thing. 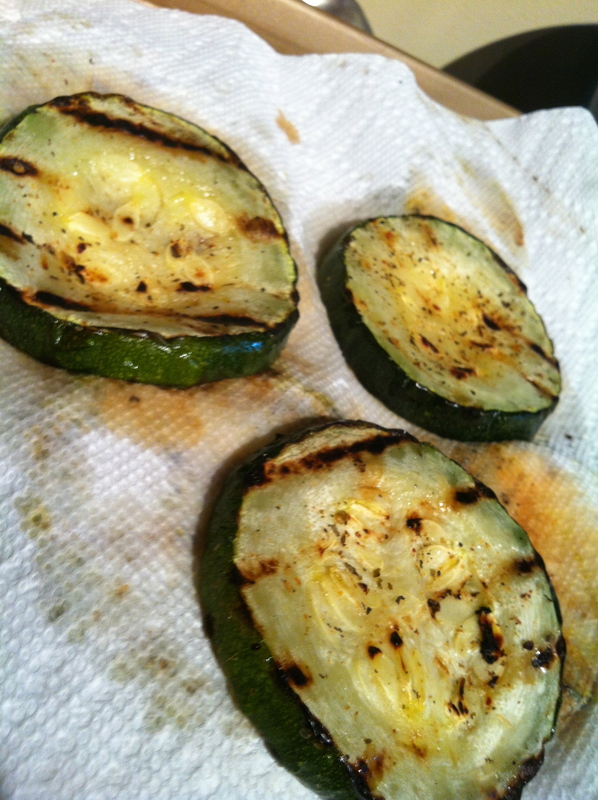 The hubs grilled them. They were lovely. Digging desperately in the freezer, I found a tomato sauce I had recently made, similar to this one but with green bell peppers and ground beef. I had wanted the meal to be vegetarian, but this is what I had. So be it. I put a layer of the tomato sauce in the bottom of a baking dish, then dabbed the excess moisture out of four zucchini slices and placed them in the bottom. I sprinkled on a bit of kosher salt. 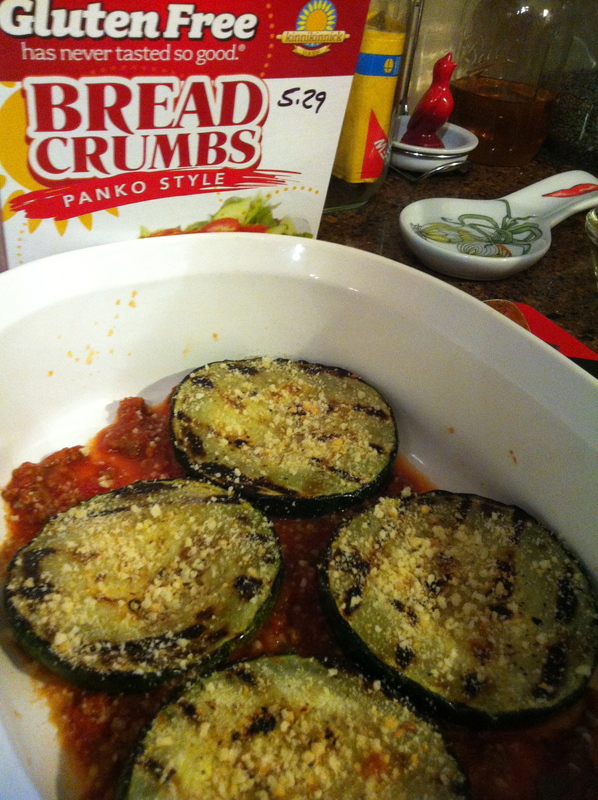 Instead of battering and frying the zucchini, I just added a bit of texture with some panko crumbs. Mine were of the gluten-free variety, which I found at a local health food store. Spendy, but nice. 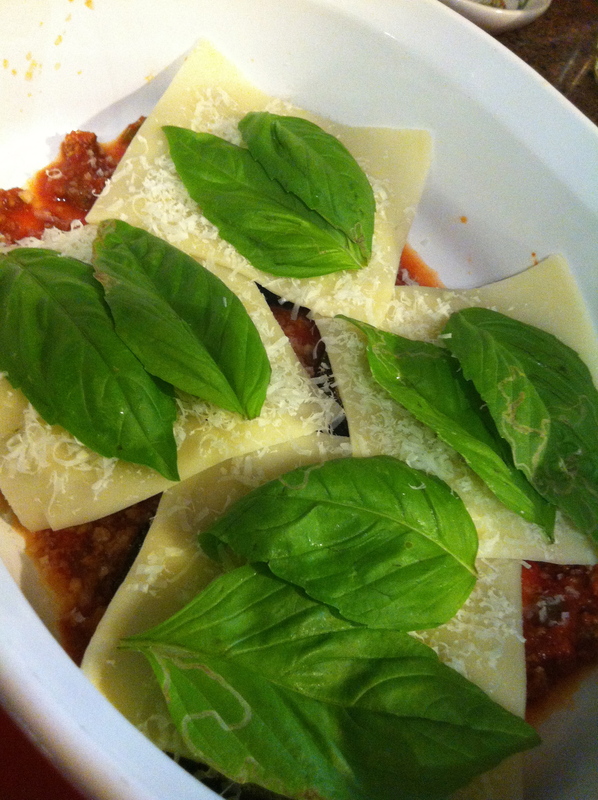 The next layer: Cheesy, pre-sliced mozzarella cheese. Kroger brand. (I’m staying committed to the use-what’s-here thing, people.) If you so desire, some medallions of fresh mozzarella would be lovely here. Top that with shredded parmesan, of which I was running precariously low. 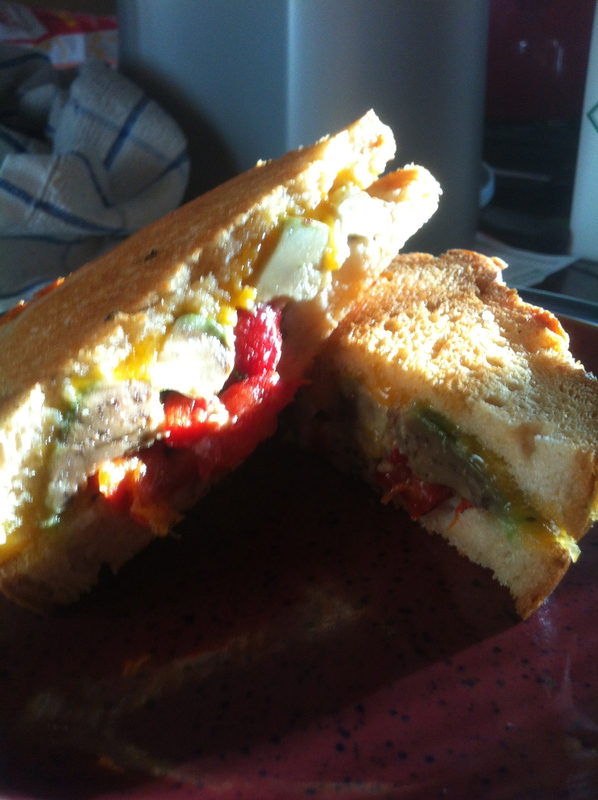 I nearly took off a fingertip with the Microplane trying to manage my remaining wedge. Vegan? 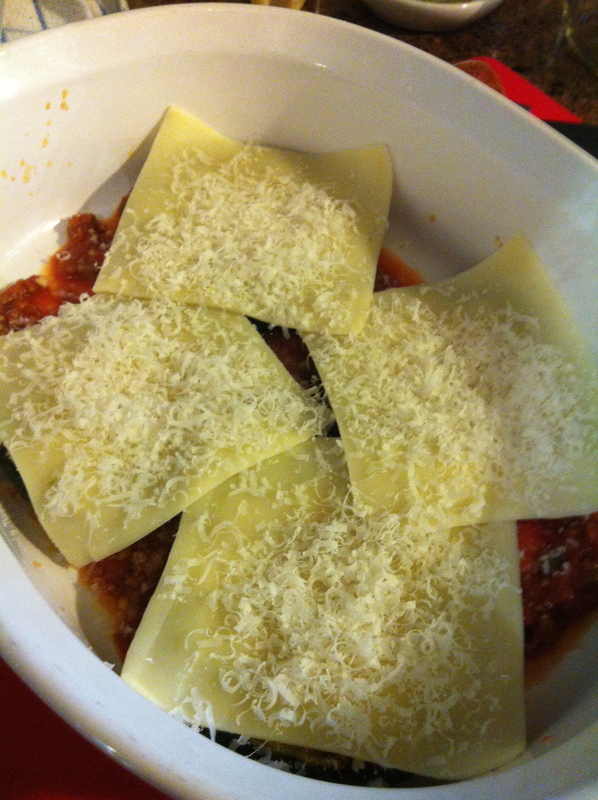 Use Daiya brand shredded mozz and make your own faked-out parm. Next step: Fresh basil, from my plant in the front flower bed. A couple leaves had been visited by some sort of munching bug; I informed my husband they were “pre-licked.” He was okay with it. 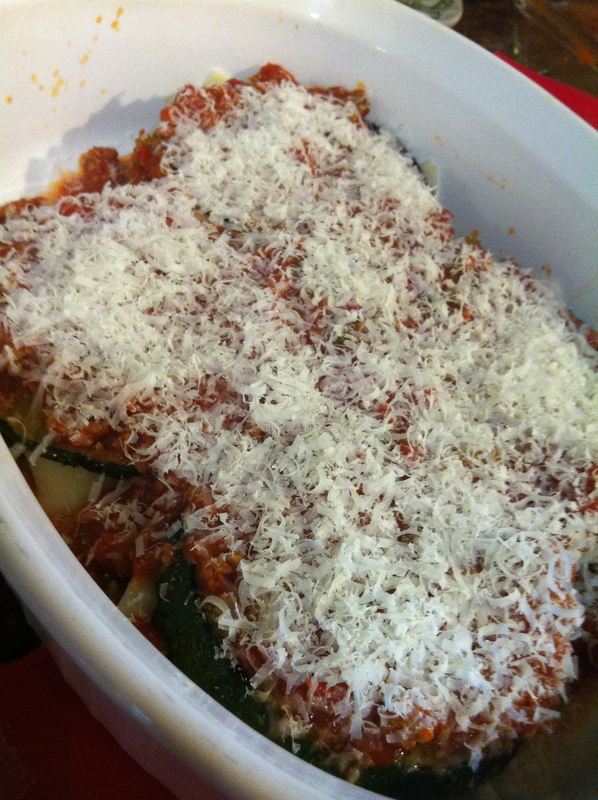 The dish was finished off with another layer of zucchini slices (carefully dabbed of excess moisture as before), the last of the tomato sauce, and another dousing of parmesan. Oven. 350. 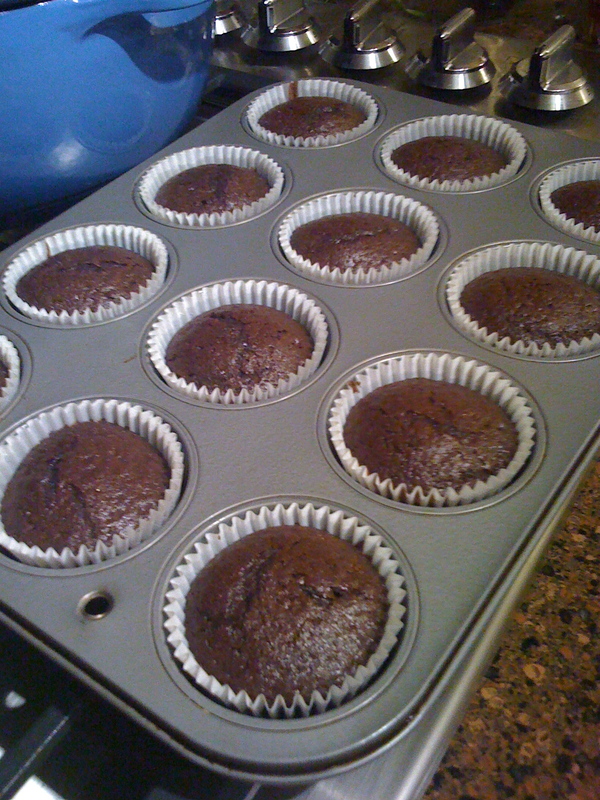 Twenty minutes or, as they say, until done. I’ll fast or something later. Yes, it’s as fancy, complicated, and mind-bogglingly time-consuming as it looks. Later, I’ll tell you how I did it. For now, I just want you to drool. Even if you don’t have to eat gluten-free. 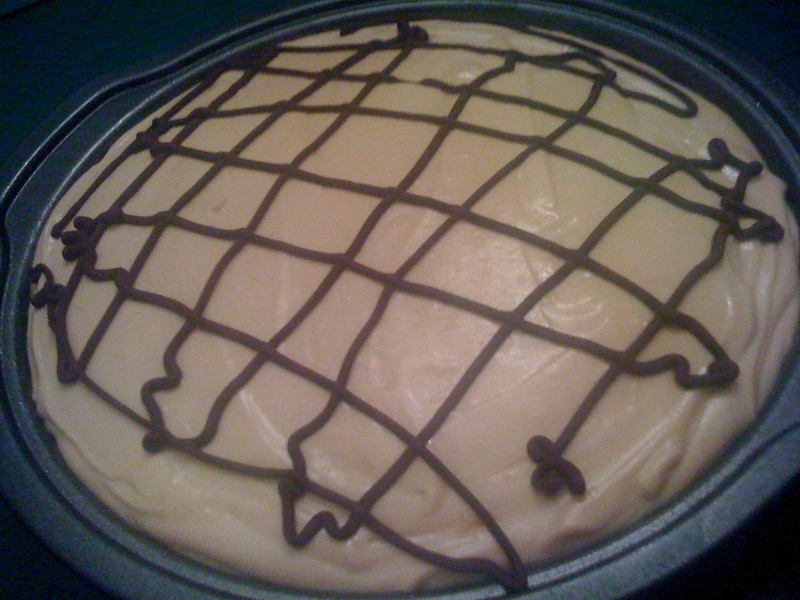 If you’ve been online at all today, you’re probably wondering what all the hubbub is about peanut butter pie. The reason is unfortunate and heartbreaking, but it’s also one of the greatest demonstrations of love and support I’ve ever seen online. Last Sunday, fellow food blogger Jennifer Perillo lost her husband, Mikey, suddenly and unexpectedly. He was young, as are his lovely wife and two kids. I’ve never met any of them. Before Sunday, I couldn’t swear that I had ever read her blog, although we had crossed paths a few times on Twitter. 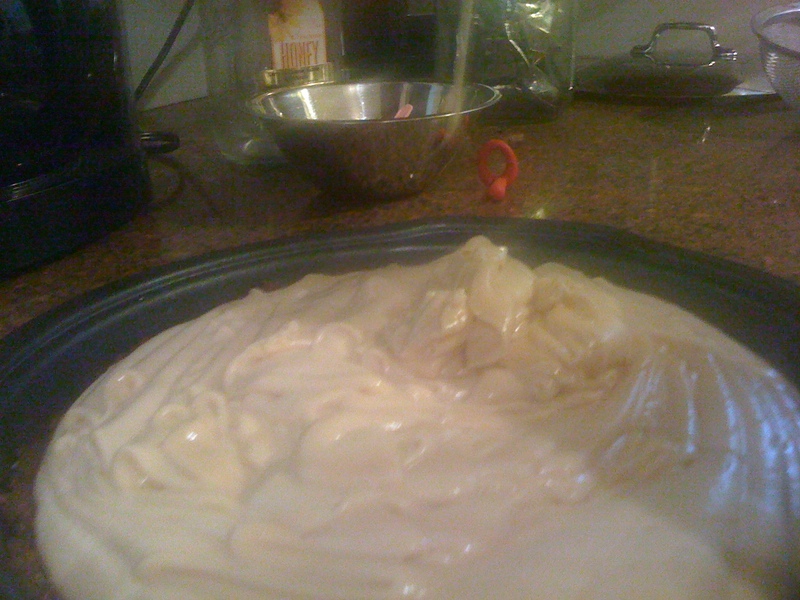 She asked that anyone wanting to “do something” do this: make a pie. A pie for Mikey, and for those we love. 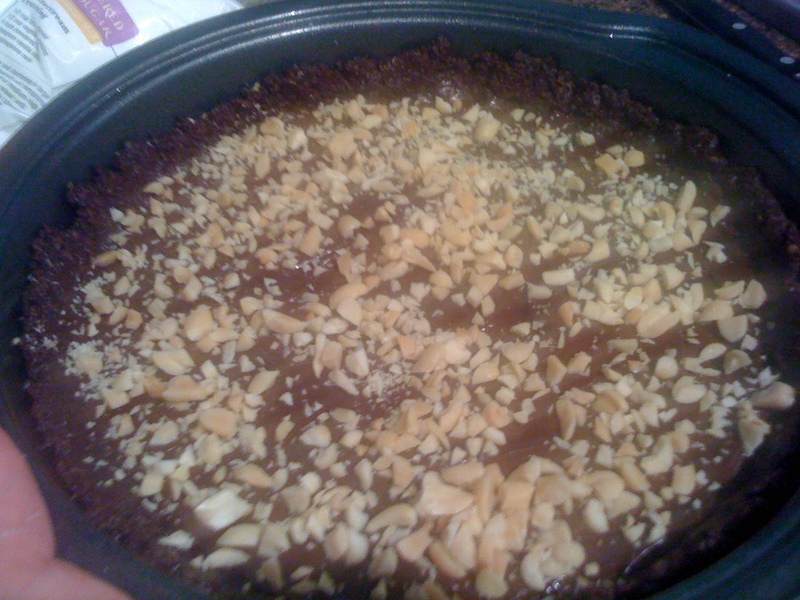 Mikey’s favorite, a peanut butter pie. Today, on the day of his memorial service, hundreds of pies have been made and posted. 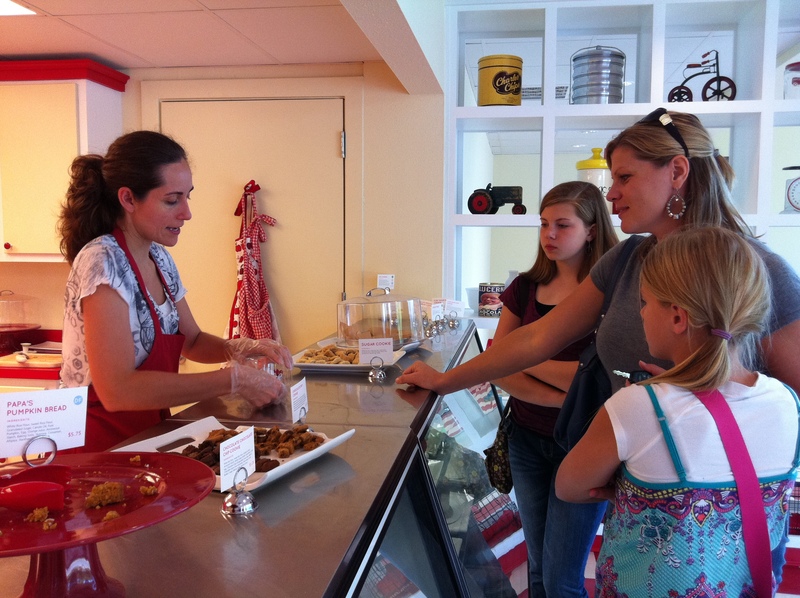 CNN, Food Network, TasteSpotting and others are featuring them. 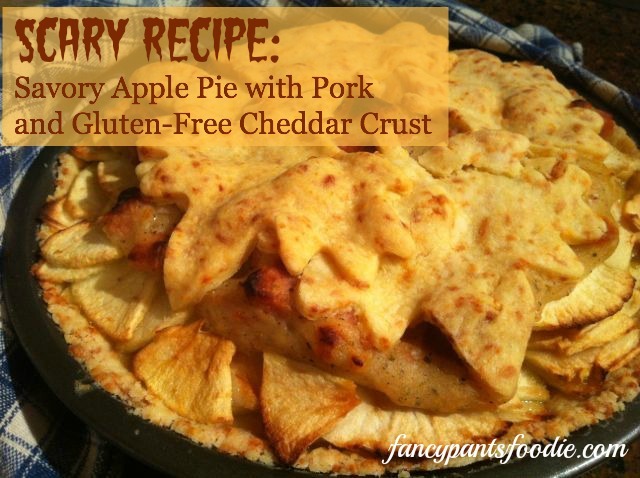 Having now gone gluten-free, I did have to make a few adaptations to Jennifer’s recipe. The cool thing is, so did just about everyone who did the pie. Take a look around online and see. I used Pamela’s Dark Chocolate Chocolate Chunk Cookies, which are gluten- and dairy-free. 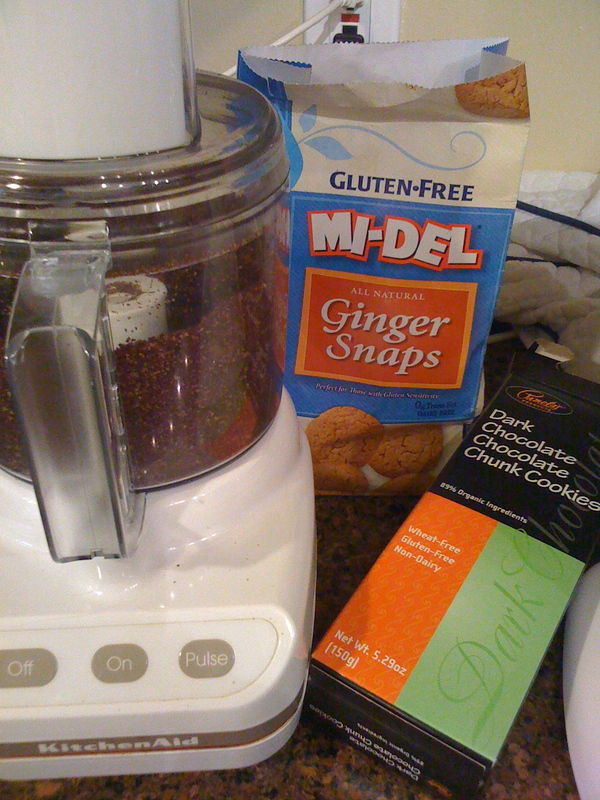 I didn’t have quite enough to make a crust, so I added a few Mi-Del Ginger Snaps. While I’m making the pie, my hubby Joe is sitting at the breakfast bar in the kitchen, hogging the laptop which is displaying the recipe. I have to keep asking him to read me the next step. 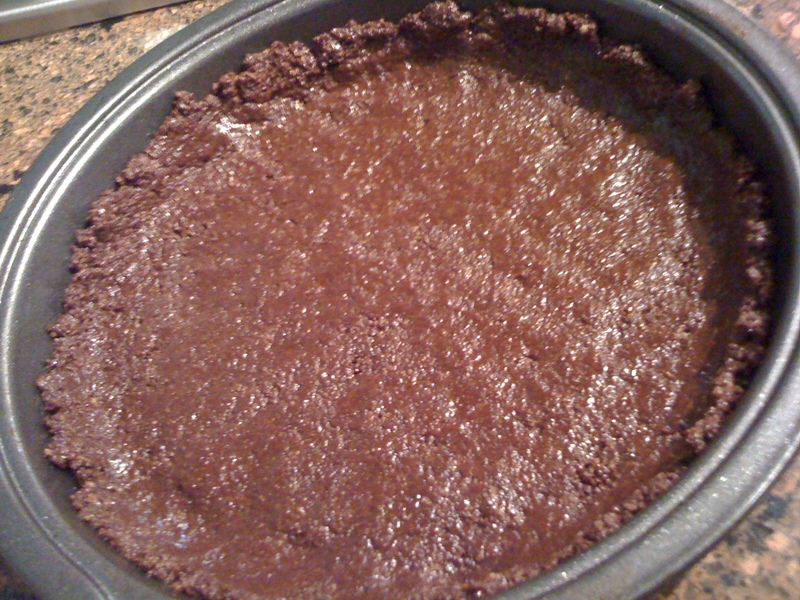 Ground cookies and butter, pressed into a pie pan. 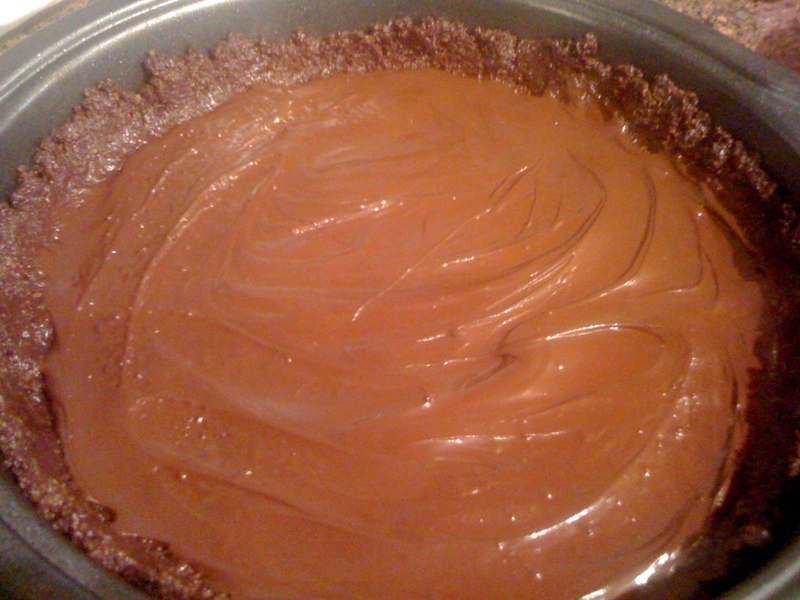 Layer of melted chocolate spread over the crust. Chopped peanuts pressed into the melted chocolate. I love him for being different than me. I told him this yesterday. I love that he’s passionate and occasionally obsessive. We make a good mix. I love him for the things we agree on, the things that matter. Our faith, our family, our dedication to each other. I love him for not getting too bent out of shape about the things that don’t matter. I love him for knowing the difference. 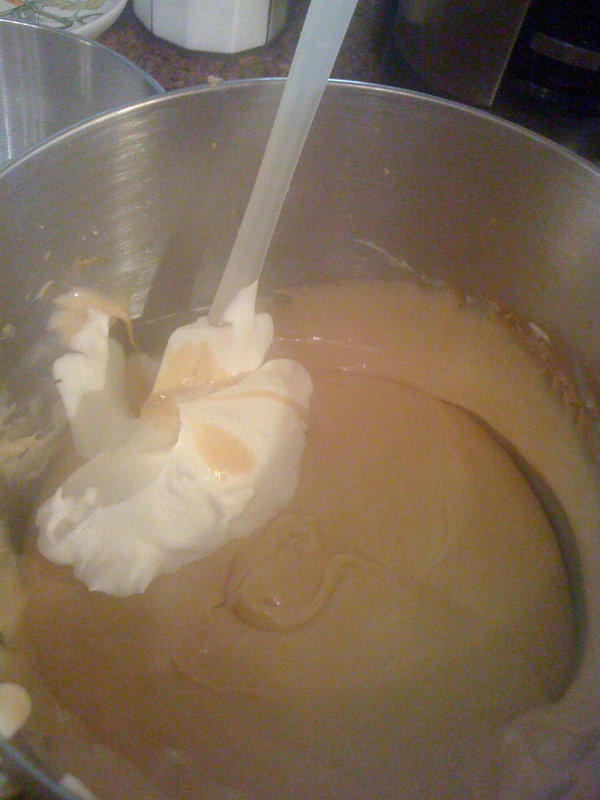 Peanut butter filling going in; photo by the big kid. I love him for sitting at the breakfast bar, just to be near me, while I made this pie. After I had poured the filling, he tasted a bit that was left in the bowl. “Mikey had good taste,” he said. That’s It, I’m Going (Mostly) Gluten-Free. That’s how I’ve felt the past month or so. If you know me and you haven’t seen me, well, I’ve been piled in a lump at home. With a history of chronic fatigue and muscle issues, I know good and well what the fix is. I’ve done it before. And I don’t mean the typical, weight-loss kind, although I could use that about now, too. I mean no wheat, sugar, corn or dairy. I completely cured myself about 10 years ago eating this way for a solid month, then eating reasonably close to it after that. At least, until I fell off the wagon in a decade-long slippery slope. Such draconian measures sounded like a bit too much to attempt right this minute, so I started with gluten. One day this week, I just decided. Now. Okay, nnnnnnow. 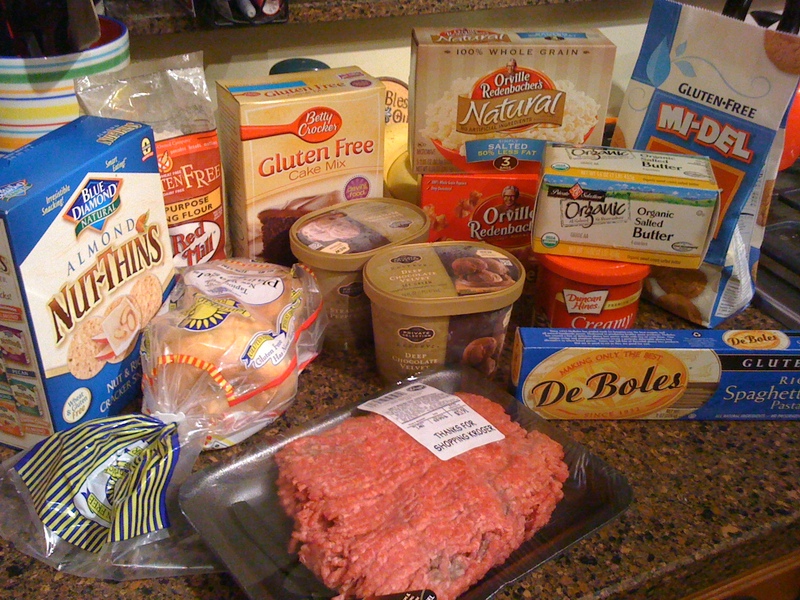 This is what late-night, gluten-free binge shopping looks like. It sure looks handsomely packed with the best nutrichef vacuum sealer there is. For someone who generally tries to shun processed foods, this is friggin’ ridiculous. But, those Betty Crocker gluten-free cupcakes were awfully good. Yes, they have a mix. I’m embarrassed now that I bought all that stuff (minus the scratch-cooking necessities), but some of it was useful. I do plan to develop similar recipes from scratch, and now I know what standard to hold them against. And I do need some emergency goodies for when I’m desperate. Why does your post title say “mostly,” you ask? I don’t have Celiac disease, I’m just sensitive to gluten. So, I’ve not done as well about sticking to the program as I should. Within a week, I’ve already had a grilled cheese sandwich from McAlister’s and some pizza from the local dive. Both were due to poor planning when going out to eat with the family. Sounds like I need to make a list. When I did this 10 years ago, I was really, really sick. I was so weak, I didn’t have the strength to cook like I do now, although I often get too tired to get completely cleaned up afterwards. Mostly, I ate short-grain brown rice, veggies, Braggs Aminos, and the occasional small portion of meat. Sometimes I made casseroles with legumes, veggies and whole grains. It worked. The real test will be at the end of this month, when I travel to the International Food Blogger Conference in New Orleans. (Did I mention I won the contest from the previous post? Eeeek!) It will be food mecca, with lots of temptation, I’m sure. 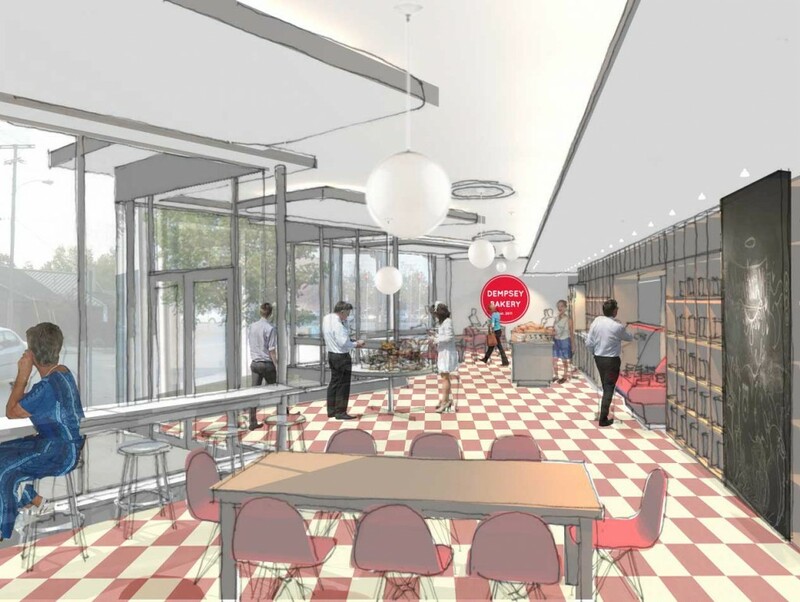 But they’re also going far out of their way to feed, teach, and inspire gluten-free folk, of which there are many in the food blogger world. I know there’s more of you out there. Let’s help each other out. One of these days, I hope to cook for you. As I learn more, here’s to better health.